Spiritual travel is different from dreaming in a number of important ways. In spiritual travel, the traveler's awareness is heightened and the traveler is able to direct the experience if desired. This is unlike dreaming, in which the dreamer's awareness is dulled, and the dreamer lacks initiative. In most dreams, the dream drama unfolds as if controlled by some outside force with little or no control exercised by the dreamer. In spiritual travel, the traveler is also aware that he or she has left the physical body and the world that is encountered is not the physical world. In normal dreaming, however, the dreamer believes the dream to be real as if he or she is acting in the physical world. This explains the great fear in nightmares where any threat is perceived as a threat to the physical body which could result in death. Since the spiritual traveler's awareness is clear and concentrated, there is usually no difficultly remembering the experience. Many people have trouble remembering their dreams because most dreamers experience a dulled form of awareness during dreams. Following a spiritual travel experience, very seldom does the traveler fall back into a dream state or unconscious state. The intensity of spiritual travel does not lend itself to immediately reentering sleep or dreams. In most cases, there is an awareness of returning to the physical body, and the person awakens immediately after a spiritual travel experience. Though spiritual travel may begin by "waking up in a dream" (lucid dreaming), the dream drama usually stops as soon as the dreamer awakens. The symbolic content of a dream usually stops immediately when the lucid dream begins, and the dreamer senses that he or she is now in control of the dream's events. 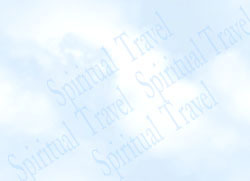 Spiritual travel also provides a much broader range of experience than is present in dreams. The lucid dreamer with the right training can use the lucid dream as a jumping off point to explore a wide variety of spiritual and psychic states not available in dreams. Once one inner reality is entered consciously, it is relatively easy to enter another because the lucid dream state is much like being in an elevator in a building. The dreamer who learns how to push the correct buttons can trigger a transition to a different floor or plane of reality. Lucid dreaming is only one of the ways that spiritual travel can be initiated. Spiritual travel may also begin during meditation, or as a result of a traumatic shock to the body. The fact that a spiritual traveler can go directly into an inner world via meditation without the loss of consciousness that occurs when spiritual travel begins from the dream state seems to indicate that spiritual travel states are independent of and not to be identified with the dream state. The dream state is only one of a set of doorways which can be used to reach spiritual travel states. One of the difficulties of distinguishing a normal dream state from a lucid dream state is that there are degrees of lucidity. Sometimes there is increased awareness in a dream where the dreamer believes he has awakened but then goes on to act in a way that is uncharacteristic of someone who is completely awake. Awakening completely means that the dreamer reacts to dream situations in the same way he or she would react if awake in the physical world. Sometimes this semi-waking state manifests as an inability to act to change the dream. Here there is a strong sense of waking awareness which is accompanied by a passive attitude of acceptance and powerlessness. Another form of semi-waking consciousness occurs when the dreamer has limited access to normal memory and cannot recognize familiar persons or situations. Here, the dreamer has a subset of his normal memories and cannot react normally to the dream situation because of these missing memories. Also, a form of semi-lucidity occurs when the dreamer feels lucid in the dream but the dream drama continues as the psyche or personal unconscious continues to produce symbolic content in the dream. Here dreamers may continue to interact with figures in the dream, and even for example consider themselves to be imprisoned in the dream state as they seek to escape frightening situations but are unable to wake up. Full lucidity generally means that dreamers can wake up if they desire to wake up. This semi-waking consciousness muddies the distinction between normal dreaming and lucid dreaming. True lucid dreaming has a crystal clarity that somehow feels even more powerful than the usual clarity of waking awareness, and it is this kind of lucid dream state that is easily distinguished from a normal dream state. The clarity of perception of the lucid dream state also allows the dream traveler to examine and evaluate the complexity of the lucid dream environment which is not something that most people in a common dream state are able to do. Lucid dream environments often contain so much complexity and detail that it would take dozens of Hollywood set designers and builders weeks and even months to construct them. Such complexity makes the claim that the dream environment is a product of the dreamer's imagination or unconscious mind seem impossible or at least highly unlikely. Anyone who has done mechanical or architectural design, engineering, and construction knows the tremendous awareness, planning, and care that necessarily goes into making a product like a bicycle or building a single, simple structure like a staircase. Both design and construction are extremely time-consuming processes requiring days and weeks of work to design and/or build relatively simple structures. No individual could instantaneously (or over a period of a single night) create the complexity of a moderately complex lucid dream environment on his or her own. And adding to this complexity is the challenge of the mind creating an animatronic dream body which is fully functional for the lucid dreamer to inhabit and use to interact with the lucid dream environment. In short, dreamers lack the time, skill, and concentration necessary to create most lucid dream environments. Therefore, as is the case with physical environments, the source of such creation (including both body and surrounding environment) must necessarily be outside of the dreamer's mind. Being outside the dreamer's mind makes the lucid dream environment part of some larger parallel plane of existence which contains objective elements though it may not be called objective in the same way physical objects are described as objective. This is primarily because dream objects in spite of their complexity lack the stability of physical objects and shared experience of these objects in the dream world is extremely difficult to document and verify. Neuroscientists who insist the mind is identical with the brain will generally acknowledge that the waking brain has many limits on its creative capacity (excepting the brain of a creative genius like a da Vinci or a Picasso). However somehow the average sleeping brain becomes massively creative during both lucid and normal dreaming to the point of being almost god-like. The dreamer with no prior experience or education becomes a script writer, actor, director, costume and set designer, prop maker, lighting expert, and many other things to produce a complex dream play in real time. The lucid dream state allows the dreamer to examine one of the most detailed elements of the play - the set and all of the objects it contains. Surprisingly, the obvious inconsistency in the capacity of creativity when comparing the sleeping and waking brain does not seem to disturb neuroscientists. This is perhaps because lucid dreaming where this creativity is most noticeable occurs randomly in most subjects and is therefore difficult to study. However lucid dreaming brings the challenge of explaining all this creativity into stark focus in a way that normal dreaming does not. The fact that lucid dreaming presents this challenge when normal dreaming usually does not is yet another way of distinguishing lucid dreaming from normal dreaming. However it is also likely that these complex dream phenomena are inconsistent with the neurological model of a brain that is biologically limited and chemically-driven. As with near-death experience, it seems embarrassing for neurological reductionists to admit that they have no convincing biochemical or neurological explanation for the massive burst of creativity that occurs in the recurring psychological phenomenon of lucid dreaming and to a lesser extent in normal dreaming. This is especially true when dreams have been the object of serious study for psychologists since the late 19th century. Psychologists sometimes seem to view dreams as edits of memories of previous everyday experience that have been somehow spliced together and replayed in dreams. This approach might account for complex dream experience in some instances but in lucid dreaming, the dreamer interacts consciously and creatively in unpredictable, spontaneous ways with the dream environment. So this "replaying the past" theory breaks down since it becomes impossible to find an edited memory fragment that can be inserted to provide the contents of this kind of unpredictable, interactive dream experience. Our conclusion is that if the complexity of lucid dream environments is beyond the creative capacity of the natural mind or brain to produce then, as with objects in the physical world, this complexity must originate outside the person's mind. Since lucid dream objects are not physical objects they must originate and exist in some parallel plane of existence. The nonphysical place or plane where lucid dreams exist can be accurately described as a nonmaterial or supernatural world. If lucid dream experiences are not physical and not a product of the dreamer's mind (because no person's mind could be that creative), they must be part of some metaphysical reality. And as stated previously, if there is one nonmaterial world or space that contains dream experience, there are probably many more and these would include the spaces where the spiritual traveler goes during spiritual journeys. The spiritual matter page illustrates just how creative the mind must be and how clear and convincing the reality of lucid dreaming is by describing how reality testing is done with the objects in the lucid dream. The lucid dream method page gives the advantages and disadvantages of entering into the inner world via lucid dreaming as opposed to using other less gentle methods of transition. For a more cosmological discussion on the relationship of dreams to "higher states of consciousness", see the hierarchy of dreams page. Another important point to note is that spiritual practices affect dreams. The contents of dreams often echo significant activities performed in the waking state. Therefore, spiritual practices done in waking life on a regular basis will sometimes lead to the dreamer spontaneously repeating such practices in dreams. This will likely result in waking up in the dream and can even precipitate powerful spiritual experiences. Even when the practices are not having obvious results in a waking state, the openness of the dream state can permit such practices to produce the out-of-body states that they are intended to produce while awake in dreams instead. The discussion above assumes that the lucid dreamer has a "dream body" which is usually the case in lucid dreaming (a subcategory of spiritual travel) but this is sometimes not the case. In the case where there is no dream body (some Tibetians practice erasing the body image in Tibetan Dream Yoga), and the dreamer experiences being a point of consciousness or existing in another type of body (shape-shifting), there is no difficulty in distinguishing this kind of spiritual travel from normal dreaming. The differences between normal dream body consciousness and these other types of consciousness are striking and unambiguous. Such experiences are clearly not dreams. Finally, it is not necessary wake up in a dream to do spiritual travel while asleep. Many of the experiences at this site occurred spontaneously while the traveler was asleep without actually beginning in a dream. Adopting a spiritual practice that emphasizes spiritual travel will tend to produce such spontaneous travel experiences where the sleeper "pops into" out-of-body states while asleep without first being in a dream. Having tried to describe the differences in analytic terms, it is necessary here to state that none of these distinctions really captures the qualitative differences between normal dreaming and spiritual travel or lucid dreaming. The quality of awareness is just different in ways that seem impossible to describe. One thing that can be said is that this "difference" in consciousness sometimes inspires awe and fascination. There is also many times the direct and immediate sense that one's soul is composed of spiritual energy with much potential. It only awaits thought to activate that potential energy and direct it towards some end. It is up to the traveler to train his or her mind and increase the ability to concentrate to be able to direct this energy towards some desired state of consciousness or new form of knowledge. It is important to understand the differences stated above so as not to confuse spiritual travel with dreams. However it may be difficult to convince someone who has not done spiritual travel that it is different from dreaming no matter how many distinctions are drawn.